“Not that I have already obtained this or am already perfect; but I press on to make it my own, because Christ Jesus has made me His own” (Phil 3:12). If there’s one thing most Lutherans know, it’s that we’re not perfect. That probably comes from Martin Luther, who reminds us that we are “simultaneously saint and sinner.” And that comes from St. Paul who assures us that all have sinned, that no one is righteous, not one! It’s good for us to know that while we are still sinners we are saved, redeemed by the death and resurrection of Jesus. Why then does St. Paul talk about perfection? Does he think any of us could attain perfection in this life? Why even mention such a thing to us sinners who, though we know the right thing to do, still do the wrong thing? Paul is talking about “perfection” because he realizes that, although we are saved, still we stretch forward toward the goal of holiness, righteousness and goodness. As we said in yesterday’s devotion, we are to seek good and not evil. Being redeemed by Jesus Christ as a gift doesn’t free us FROM striving to follow God’s laws and commandments; it frees us FOR even greater obedience, knowing we do so not to save ourselves. 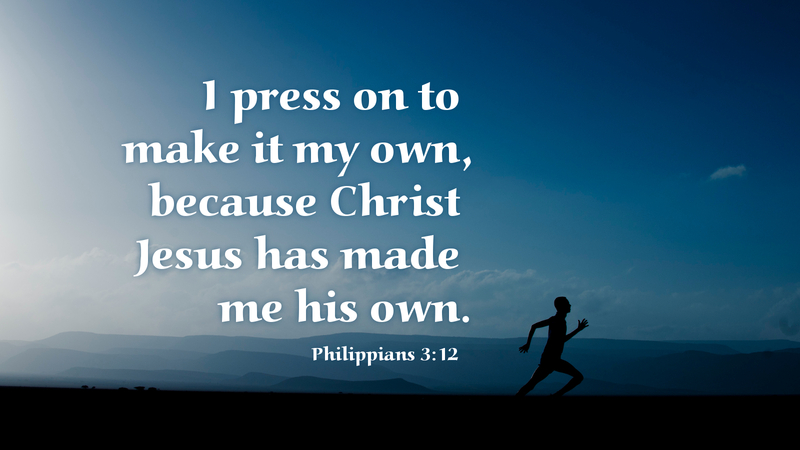 Being saved, we respond to the gift of salvation by our attention to God’s Word and command, knowing we will never reach perfection, but always pressing on to make it our own, because Christ Jesus has made us His own. Throughout the season of Lent, let us press on toward perfection—let us “strain forward to what lies ahead, pressing on toward the goal for the prize of the upward call of God in Christ Jesus,” as Paul continues in our daily reading. Prayer: Almighty God, because Christ Jesus has made us His own, give us the strength, energy and fortitude not to accept our sinfulness, but to strive for obedience, through the same, Jesus Christ our Lord. Amen.